For those who haven’t heard of what Startup Weekend is all about, it’s building a company on STEROIDS! From visualization to conception, and actually taking the product to market, a company usually takes about 1-2 years to create. We had exactly 54 hours! This story highlights my experience at the event as a participant. Friday Night, people started trickling in at Coloft at 6pm. There were a few hours of just networking and playing an ice breaking game to get to know people. I loved the energy of it all. 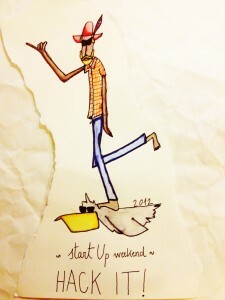 People were so excited for the weekend, many of who have participated in Startup Weekend before and a few like me, who were there for the first time. People had one minute to “pitch” their idea to the group as a whole. Of the 150+ participants, about 45 people pitched that night. Out of those 45, the top 10 were voted to build teams on. I was #33 to go up and pitch my idea. Once the pitches were done we were given a cup and paper with our company name on it. Everybody had 2 red tickets to vote for 2 companies they liked. We had to walk around the room soliciting for votes, which I compare to how it must feel like begging for change. I had a few votes but I wasn’t sure if it was enough to get the top 10. As they announced the top votes, I was ecstatic when my number was called. I felt like a winner already, smiling from ear to ear! Unfortunately, being voted top 10 doesn’t guarantee you a weekend company. You still need to build your team. Although, many people believed in my idea, I found it difficult to create a full team that can execute an MVP (Minimum Viable Product) by Sunday. The team needed would consist of at least 1 non-technical business person (me) and 2 or more technical people—designer and developer. Before the pitches started, I ran into a fellow Trojan I knew who just graduated from USC, Nathan Doctor. I initially planned to join his team, in case my idea wasn’t voted in top 10. One of the first friends I met at Startup Weekend was Arnaud Collery, he pitched as well but his idea didn’t get enough votes. He told me that he was going to join the group of developers since he wanted to learn more about the tech side of building a business. To my surprise, it was Nathan’s team that he was joining. Because I had such a pain finding developers, it only made sense for me to join the team with many developers. Nathan, pitched Code Wars as a platform for developers/coders to test their skills against each other and get ranked in what would be an impromptu micro-hackathon. We may have had one of the most diverse teams that weekend. By diverse, I mean by age range (16-39), ethnic background and experience. The team included the following people– Shivam Thapar, a designer and front-end developer attending Troy High in Fullerton, CA; Justin Ko, also from Troy High started learning to program in 8th grade and has since been working as an independent developer; Jake Hoffner, is a self-taught web developer with 13 years experience, currently working as the lead prototype developer for DirectTV, ideating on future digital products; Nathan Doctor, a recent grad of USC finishing a dual-major in Architecture and Business Entrepreneurship with a strong experience in UX/UI; John Meeker, studied Computer Science at UCSB, an expert web developer and design; Kaushal Shah is a student at Berekely with 3 years of startup experience; Andrew O’neal is the owner of SolidWize.com, providing online 3D modeling training to mechanical and industrial engineers; Arnaud Collery, is a French actor , award winning filmmaker and comedian with a background in business and inspirational speaking; and myself, Denise Walker, with a background in Marketing and Product Development, graduating from USC with a major in Business Administration and concentration in Entrepreneurship. The next day, the technical team started coding away, building a cool game for developers to battle skills on. Business Development (BD) worked on a business plan, market research and customer validation. We struggled figuring out what our MVP should be as there were so many possibilities, building a cool game for developers to battle each other one-one-one, online hackathons, coding education, job list for employers, ranking system and many, many more. Ninjas! That “Aha!” Moment…Back on Track! All the pivoting we were doing left us frustrated. But as we were throwing out different ideas out there for new companies, getting more and more ridiculous and more and more further away than the original concept, someone said, “We should just make this like a ninja theme since coders like to call themselves Ninjas!” Instead of rewarding people with badges for their accomplishments, we can reward them with different colored martial art belts! We talked about entering the Dojo, having a green health bar on top that would slowly diminish as developers, “attacked.” We started hi-fiving each other, getting excited once again and the credit goes to one word… NINJAS! With a new idea to jumpstart the team, we were back on track. Once the “Ninja” idea came in to play, we stopped fighting trying to minimize our ideas and just focused on the bigger picture–that this is an idea with lots of potential to make money. We can charge a monthly subscription fee from developers, charge employers for access to proven skilled developers, and even host and get sponsorship at online hackathons. By the end of the day, we had validated our assumptions by interviewing a few developers and employers over the phone. Pitch Day…Wake up the judges! On our last day, started to prepare our pitch. The biz dev finished out the power point slides and tech kept adding more and more to the features. We knew that no matter how great our slides were or how amazing the website was, something different had to be done to get the judges and the audiences full attention. Earlier that day Arnaud and Matthew learned that they both lived in Japan for a few years and they both spoke fluent Japanese. I thought it would be great for them to go up for about 10 seconds before the pitch began, pretending to be coders playing the game, speaking Japanese. Two white guys speaking fluent Japanese should certainly grab people’s attention. We were all laughing as they rehearsed the pitch. Nathan was to pitch the company and we drilled him with tough questions after each rehearsal to prepare him for the judge’s criticism. Third place winners were my friends from KickScholar, a crowdfunding platform in which you can raise scholarship funds in the name of a person that has inspired you. When the 2nd place winners were called and it wasn’t Code Wars, I had a strong feeling we were going to win. 2nd place went to JukeBox.js, an online JukeBox. 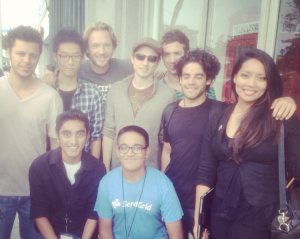 “And the 1st place winner of Startup Weekend LA…drumroll please…CODEWARS!! !” I went up in front of the room with my team, and we were so ecstatic. The judges praised our efforts and said that we were a good team to execute the product. We were all in such a high for winning the competition!!! If you’re a coder and want to battle other developers and test your skills, check out CodeWars. If you you’re not a developer and just want to see how it works, you can watch our presentation here. Also, look out for my follow up article in a month or so here on TechZulu to see the status of the company.